1889 Evening Star Map of Washington D.C. Scarce and beautiful map of Washington D.C. drawn for the inauguration of Benjamin Harrison. Map of the City of Washington with compliments of The Evening Star. Souvenir of March 4th, 1889. 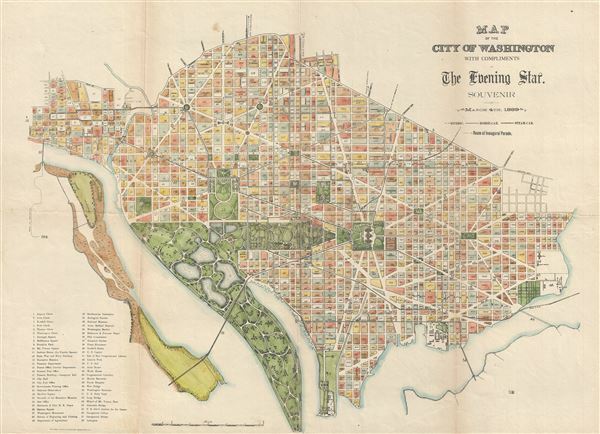 A spectacular and scarce 1889 map of Washington D.C. issued for The Evening Star newspaper. The The Evening Star hired the photo-lithography firm of Bell Brothers to produce this appealing map to commentate the inauguration of Benjamin Harrison as the 23rd president of the United States. The map details and number each city block with important buildings and intersections identified numerically with an associated tabular legend in the lower left quadrant. The map further details the route of Harrison's inauguration parade from the Capitol to Washington Circle. The map additional identifies herdic (horse drown carriages or omnibuses), horse-car (horse drawn trams), and steam-car routes throughout the city. This map is extremely scarce. We identified only one other example, that one in flawed condition, on the market in the last 20 years. Only 9 examples recorded in the OCLC. The Evening Star (fl. 1852 - 1981), Washington Star, or Washington Star-News was a daily afternoon newspaper published in Washington, D.C. between 1852 and 1981. For most of that time, it was the city's newspaper of record, and the longtime home to columnist Mary McGrory and cartoonist Clifford K. Berryman. On August 7, 1981, after 128 years, the Evening Star ceased publication and filed for bankruptcy. In the bankruptcy sale, The Washington Post purchased the land and buildings owned by the Star, including its printing presses. Bell Brothers (fl. c. 1870 - 1910) were an engraving and photolithography firm active in Washington D.C. in the late 19th and early 20th centuries. The firm produced various lithograph maps and other illustrations for both government and private markets. Little else is known of their business. Very good. Backed with archival tissue. Bryan, W. B. Bibliography of th District of Columbia, page 123. Phillips (America) page 1035. OCLC 16708404.